A Touch of New Zealand Situated just 20 minutes from the Drury off-ramp of New Zealand's Auckland Southern motorway (S.H.1), visitors may sail a scow, take a ride on a beautifully restored steam train, visit a farm park or heritage sites, take a leisurely stroll through many gardens (including waterlily gardens), fish in some of the sheltered bays of the Manukau Harbour or take time out to try a spot of trout fishing on one of three local fresh water lakes. You can picnic in the beautiful Waiuku Pine Forest or visit the Kentish Hotel in lower Queen St, which is reputed to be New Zealand's oldest continuously licenced hotel. The Tasman sea, Manukau Harbour and Auckland City can be viewed from the Signal Station or you can take a guided tour through the BHP Steel Mill Plant at Glenbrook. These are just a few of the many diverse attractions in and around Waiuku. 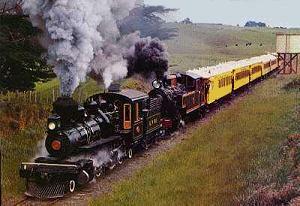 The Glenbrook Vintage Railway is a heritage railway, operating steam locomotive hauled vintage passenger trains on nostalgic 12 km return trips through beautiful rural countryside, near Waiuku. The Railway operates on Sundays and most Public holidays, from Labour Weekend (late October) to Queens Birthday Weekend (early June) inclusive. Trains run hourly from Glenbrook Station, 11am to 4pm. The return trip takes approximately 45 minutes, including a stop at the Workshops, to view restoration work in progress. The Glenbrook Station complex includes a large free parking area, refreshment rooms, souvenir shop, toilets (incl. wheelchair access), picnic area and childrens play area, motor jigger and hand jigger rides. Also adjacent to the station, is the Glenbrook Farm Park (small entry charge). To reach the G.V.R., take the Drury off-ramp from Auckland's Southern Motorway and follow the main Pukekohe Road for 7 km. Turn right at the Caltex Service Station and follow this main Waiuku Road for a further 13 km, before turning left into Glenbrook Station Road (signposted). Aviaries with a wide variety of Exotic Birds set in parklike surroundings.